This aesthetic and fragrant flower is cultivated for its beauty and for perfumes. Of the more than 200 varieties of the Pelargonium genus of flower species, not many are used to extract essential oils; but #geranium is one of the few and it has been for millennia. Historically, the ancient Egyptians applied geranium to the skin and used it internally to take advantage of its many benefits. The Victorians decorated formal arrangements with geranium leaves and even chewed on a sprig along with the plant’s flowers in cakes, jellies, and other desserts. They also steamed geranium in teas. The oil of geranium enhances skin health when used topically, supports liver health when used internally, and can also be diffused for nerve and calm feelings of occasional anxiousness. For radiant and youthful skin, use in a steam facial. Support oily skin by adding a drop to your moisturizer. For oily or dry hair, add two or three drops to shampoo or conditioner. Alleviate occasional stress, or tension by diffusing throughout the home. 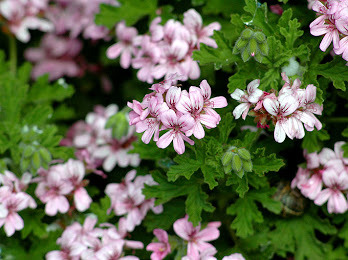 To reduce skin sensitivity, dilute Geranium essential oil with Fractionated Coconut Oil. Geranium essential oil should be kept out of reach of small children. If receiving medical attention or are pregnant or breastfeeding, always consult with your physician before using essential oils. If you have sensitive skin, dilute heavily. Sensitive areas, ears, and eyes should be avoided when using this oil.